Based in Charlottetown on Prince Edward Island, the company began in 1997 and now offers the quickest way to get from Portland to the beautiful Nova Scotia province with their ferry, the CAT, as well as daily crossings to and from Saint John on MV Fundy Rose. 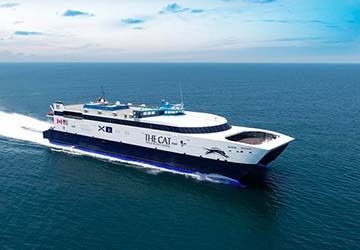 The CAT, a high-speed catamaran, allows you to reach Nova Scotia in roughly half the time it takes to drive from Portland, boasting a comprehensive range of amenities and a team of knowledgeable staff as well. MV Fundy Rose is the larger ferry, able to transport every type of vehicle from cars and trucks to motorbikes. It comes with ample outdoor deck space, too, ideal for spotting whales and other fascinating Canadian sea life. You can also enjoy a full daily breakfast, lunch and dinner menu on-board in the Acadia Eatery, get some work done in the business centre with free Wi-Fi, or relax with the family in one of the two movie lounges. 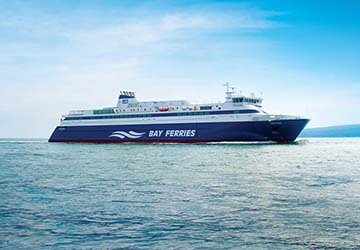 With directferries.com you can find Bay Ferries timetables, fares and book Bay Ferries ferry tickets. Where applicable we’ll also compare Bay Ferries with alternative ferry companies.